Un petite chou from Stephanie Chou. 'Kanding Love Song' shares a Gaelic feel as well as its Sichuan roots and jazz interpretation. Unique. Kangding Love Song - an arrangement of a traditional Chinese song about horse races, the city of Kangding in the Sichuan Province, and teenage courtship. The new album, ASYMPTOTE, released by DouMiao-Haricot Records, was written and arranged by Chou and combines traditional Chinese music and classical influences with American jazz and pop harmony and rhythm. It features fresh arrangements of Chinese classics, including “The Moon Represents My Heart,” “Kangding Love Song,” a tongue-twister about Eating Grapes, and a setting of one of 8th-century Chinese poet Li Bai’s most famous works. It also includes songs inspired by her love of literature and mathematics. Orchestrations feature an inventive mix of erhu (Chinese two-stringed violin), voice, saxophone, and rhythm section. Says Chou: “I was born in the US, but my mother grew up in Taiwan and my father is Chinese-American. For this album, I explored my heritage—my roots—by combining traditional Chinese music in a jazz setting. I thought about all my early memories: Chinese tongue-twisters, traditional melodies, and recordings of guzheng pieces that my mother used to play for me – things that were so ingrained in my mind as a young kid that I’ve never forgotten them.” The album features jazz musicians Kenny Wollesen, John Escreet, Zack Lober, and David Binney, as well as viola and erhu virtuoso Andy Lin. 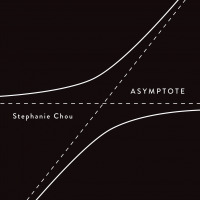 ASYMPTOTE is Chou’s most ambitious work to date. “My goal,” she says, “was to create global music that is artistically challenging, bold and fearless, and which presents a unique musical perspective.” Chou, 29, grew up in Irvington, New York, playing piano and saxophone. She has performed her music from New York to Taipei and Beijing, in music festivals around the world, at Carnegie Hall and B.B. King’s, Vermont’s Discover Jazz Festival, Harlem Festival of the Arts, and Jazz at Lincoln Center. Her 2012 ballet composition “C for G” was commissioned and choreographed by Susan Jaffe, legendary American Ballet Theater Principal Dancer (1980-2002) and former Ballet Mistress for ABT. Recently, Stephanie Chou received a 2016 Jerome Fund for New Music Grant from the American Composers Forum to write, record, and premiere a new composition with China Institute. The new work will be a musical exploration of Chinese “comfort women” enslaved by Japanese troops during World War II.